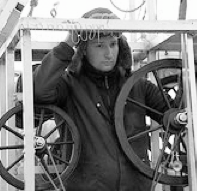 SHARMANKA (Russian word for “Barrel-Organ”) is a collaboration between sculptor-mechanic Eduard Bersudsky, theatre director Tatyana Jakovskaya, and light and sound designer Sergey Jakovsky. Eduard Bersudsky (b. 1939, St.Petersburg, Russia - then Leningrad, USSR) is a self-taught visionary artist. 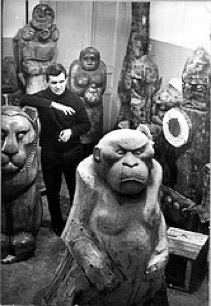 He started carving in his late 20-s, while making a modest living as a metal worker, electrician, skipper on the barge, night guard and a boiler man, and got his education in museums, libraries, exhibitions, and evening classes for drawing and sculpture. 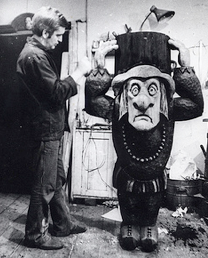 In 1974 he found a job in the park department to carve giant figures out of fallen trees for children playgrounds. 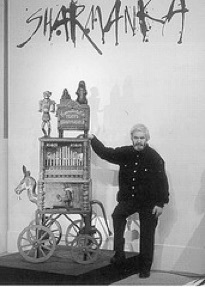 At the same time in his only room in a communal flat he began producing the kinemats - kinetic sculptures driven by electrical motors and controlled by sophisticated electro mechanical devices, incorporating pieces of old furniture, metal scrap and grotesque carved figures. Until 1989 his kinemats could be seen only by few friends and acquaintances. 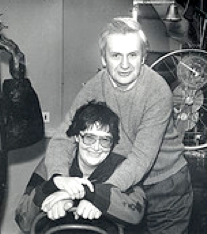 In 1993 Sharmanka was driven out of Russia by economical depression and lack of support for art. At this time Glasgow Museums bought some of its exhibits for Glasgow Gallery of Modern Art and invited it to make a personal show at McLellan Galleries. 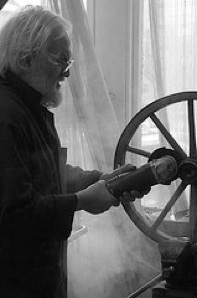 In 1996 Sharmanka Kinetic Gallery/Workshop has been opened in Glasgow Merchant City. Friends of Sharmanka is a charity, registered in Scotland SC023931. Its activities have been supported by grants of Glasgow City Council, The Scottish Arts Council, Awards for All, Gordon Fraser Charitable Trust, The Foundation for Sport and Arts and private donations.